But the first time I can say I truly felt American was when I was outside the country. I lived in Europe in my 20s, and after a while, you grow accustomed to not seeing those ubiquitous symbols like the flag, the currency, even the architecture or those phrases about liberty and justice. But one day, I happened to be walking by the American consulate in a European city, and there was Old Glory in all her glory, waving proudly over the building. And for a moment, I felt tears in my eyes. Around the world, there are various views of Americans and American culture, including many of the ways we identify ourselves and discuss our own shortcomings. But we remain a land of hope, no matter what else we may be. It is for this reason, as you read this blog, that it is so important to me that we live up to the ideas and ideals we claim to hold dear -- that all people are created equal. 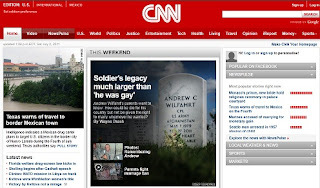 CNN, a well-known American export around the world, has as its webpage cover story an important article about Corporal Andrew Charles Wilfahrt, believed to be the first gay soldier killed after President Barack Obama signed the repeal of "Don't Ask, Don't Tell". Wilfahrt wanted to serve so that another man with a wife and family would not have to. He believed in what he was doing, and enjoyed a strong brotherhood with the soldiers in his unit -- who all treated his sexuality as a non-issue. Yet, he was denied the right to marry by the government and country he served. An analogous situation was described during the debate over the 26th Amendment to the U.S. Constitution, during a time when the draft was forcing young men to fight in Vietnam. The voting age in the U.S. until 1967 was 21, but the draft took men as young as 18 -- unable to elect officials or have a say in who represented them, but subject to the policies that might end their lives. Wilfahrt, with his service, was defending civil rights he would never fully be able to enjoy. But Wilfahrt, like my grandfather and great-grandfather, chose to fight for and represent this country. My great-grandfather lied about his age to join the U.S. Navy, an act which eventually led to his participation in the First World War. He was the son of Prussian immigrants, and the first of their children to be born in the United States. His parents Americanized their names -- Josef becoming Joseph, and Marta becoming Martha -- as well as the names of the sons they brought with them, but mostly to avoid the prejudice they knew they would encounter. They were ready to do anything to be a part of America, and instilled that spirit in their children, despite any hardship any of them might face. And my great-grandfather joining the Navy led to his meeting my young great-grandmother while on leave -- she stole his hat because she thought he was cute. My grandfather, son-in-law to my great-grandparents, was an immigrant from Eastern Europe. Ethnically, he was Ukrainian, though the region shifted from being Polish, to part of Austria-Hungary, to part of Ukraine, depending on the year. He arrived here at age 10, and learned to speak English with an American accent, hiding his immigrant roots again for fear of the prejudice he knew he would confront. He joined the U.S. Army war effort for the Second World War at age 21, because this was his country, and he was ready to defend it. He also met my grandmother while on leave, but she didn't steal his hat. I guess you could say that the U.S. military is responsible not only for my defense, but my existence. These men chose to fight and defend our ideals, and it led to their being able to start families. My father joined the U.S. Navy, just as Vietnam was starting. He worked in helicopter rescue, and did his job well. It gave him a great deal of pride to serve his country, and he chose to serve. He was not drafted. It was not about politics for any of these men -- it was about a love for this country and belief in what we stand for, whether it has been the previous generations of men in my family or Corporal Wilfahrt. My father is the only man in this article who could reasonably expect that he would not face some sort of prejudice when he came home from war, yet they all served, and served proudly. And even then, what my father could not have known was how Vietnam veterans would be treated, but I don't think that would have mattered to him -- he would have done it anyway. I have never served in the military myself. With all of my travels around the world, I have felt more like an ambassador. I have been surprised at the ideas and expectations of those in other countries about what an American should be, and how the U.S. became the country it has. I remember having a discussion in Europe with a European while the European Union was still in its planning stages. He was annoyed that the countries were bickering over the union treaty, and wished they could be more like the United States right out of the gate. He knew nothing of our Civil War, nothing of our continuing battles for civil and human rights, or how important debate remains in our society. He thought we were one people and had always been that way. We were the land of hope, where anyone could succeed and be happy. It was sad to have to correct him. We remain an ideal, however, and I value being an American. I value that I am able to write this blog and be able to criticize the government and the people and not worry that some police force is going to break down my door and drag me away. I am proud of our ability to unite for a common cause when we really believe in something. I am proud that Americans are always the first and largest donors when a disaster strikes another country, like Japan, or Haiti, or Indonesia. I am proud that every generation produces a group that wants to make a difference. Which is why it breaks my heart when we don't support each other, when simple and common sense justice does not win out, when we put religion before humanity, when we put greed before people, or we deny anyone equality for any reason. We need to do better. We need to honor the service of people like my father, my grandfather, and my great-grandfather, and the sacrifice of people like Corporal Andrew Charles Wilfahrt.